My ski season didn’t get off to a great start this winter. On the 15th December – my first proper ski day – I managed to fall and break my right ankle. For those who know me, I’m an avid skier, so this is a huge blow to me and my ski season! That day, I was skiing down one of the infamous Verbier itinerary routes – a route I’ve skied a thousand times before. I was with my husband and two close friends. I don’t know exactly what happened but I remember falling forwards, feeling as funny sensation in my ankle as I went. Both of my skis came off but it perhaps took a little longer than usual for this to happen. They were deposited about 15 metres above me and kindly collected by a passing skier – I was skiing at the back of my group. Reflection 1 from that day: make sure to get your ski bindings professionally checked at the start of each season. Back to my fall: I landed, brushed myself off and sat up. My ankle felt slightly weird but there was no excruciating pain. The passing skier checked I was OK and made sure I wasn’t alone. I sat still for a minute. As I didn’t feel too bad and wasn’t in lots of pain, I stood up and managed to get my skis back on. My ski group had now seen what was going on and I managed to ski to one of them waiting a few metres below. But when it was time to turn, it became evident something was really wrong. I was pretty sure my ankle was broken and that I wasn’t going to manage the rest of the descent. So my friend Tim immediately put a pair of crossed skis crossed a few metres above us, signalling an accident scene to other people on the route, and he called the Verbier ski patrol. Reflection 2 from that day: make sure everyone in your group knows what number to call. Check the number before you head up the mountain; program it into your phone. The Verbier4Vallées ski area uses the Echo112 mobile phone App. If you’ve been on one of our HealthFirst courses, you’ll have heard us talk about this. When you’re skiing in Verbier4Vallées, the ski patrol number appears right at the top as you launch the App. This makes your call easy and allows your exact GPS coordinates to be transmitted to them. So, back to the event: It was a beautiful day but it was also a very cold day and my accident was in a shaded area. I’d already put on my down jacket earlier because I was cold but in my backpack, I was carrying some quick-activating hand warmers. So, with the help of Tim, I slipped these into my mittens. And then I asked Tim to get my foil emergency blanket out of my backpack. But – and here’s the embarrassing bit given that I’m a doctor and a First Aid trainer – my foil blanket wasn’t there! I then remembered I’d used it on a previous outing and hadn’t replaced it! Reflection number 3 and note to self: if you use an item from your First Aid Kit, replace it immediately! I was getting colder and so was Tim. We turned a pair of skis over so the bindings were facing into the snow. Tim sat on the skis, I sat on him and we huddled together to keep warm as best we could. A number of people skied past us and checked we were OK. Fortunately, one of them had a foil blanket inside his jacket pocket – I was most grateful. The biggest issue for me that day was not the pain in my ankle – it was the fact that the longer the time passed, the colder I was getting. 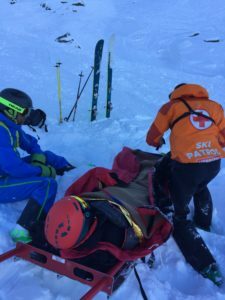 It was only 15 minutes between Tim’s call and the arrival of the ski patrol but that’s a long time when you’re injured. We now have a new supply of foil blankets available in our HealthFirst shop here. As soon as ski patroller Alain arrived, he slipped a heat pack inside my jacket which was just what I needed. And he was brilliant – so reassuring and so good at his job. He made a quick assessment and decided that the best option was to call a helicopter to take me to Sion hospital. I was manoeuvred onto a toboggan, skied down to a spot flat enough for the helicopter to land and then handed over to the Air Glaciers Mountain Rescue crew: doctor, paramedic and pilot. Within 10 minutes, I was in the emergency department waiting for my X-ray. In Switzerland, if you’re employed, helicopter rescue should be covered 100% by your accident insurance but it’s always a good idea to check your policy. If you ski off-piste, make sure you’re covered for that as well. If you’re not employed and your accident insurance is covered by your health insurer, usually only 50% of helicopter rescue is covered up to an annual maximum amount – unless you have supplementary insurance. However, if you’re a patron of REGA – the Swiss Air Rescue Service – then REGA can waive the rescue costs if you’re not covered, or only partially covered, by your insurance. But there isn’t a 100% guarantee. So reflection number 4: check your accident insurance policy and look into REGA patronage – visit www.rega.ch for more information. The end of the story? A non-displaced ankle fracture for me. The broken bits of bone hadn’t moved so luckily no surgery needed. 6 weeks in a special walking boot and 12 weeks until full bone healing. Maybe see you back on the slopes right at the end of the season!